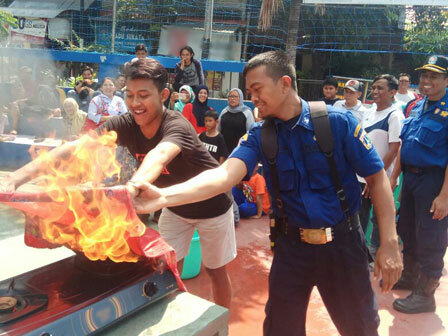 40 citizens of RW 06 Petamburan Urban Village, Tanah Abang, Central Jakarta, underwent fire socialization and was trained how to use portable fire extinguisher (APAR).
" We train them how to handle fire using wet sack and APAR"
"We train them how to handle fire using wet sack and APAR," expressed Achmad Sanjoyo, Head of Tanah Abang Sector, Central Jakarta Fire and Rescue Sub-dept., Monday (3/19). It was held at the RW 06 Office, Petamburan, which can be created on the citizen's proposal during a complaint on Saturday at the sub-district office. They were very enthusiastic and pay close attention to the material presented by firefighters. RW 06 Vice Chairman, Marsono thanked the firefighters who have provided the material for the socialization of fire handling. "It's very useful and able to prevent fire early," he stated.